"J.W. 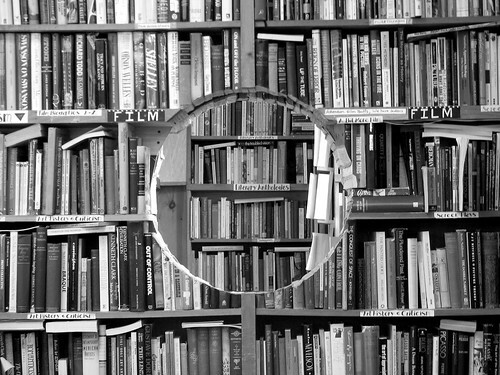 Doull's is a second-hand bookstore that is a dark and musty extravaganza of disorganization. Chaos theory originated here. Without doubt Mr.Doull has the most liberal immigration policy for used books this writer has ever seen. It is something out of Dickens. The bookshelves stretch interminably upward, stuffed beyond all decency with all kinds of books. Shelves hang over doorways, or stand towering in the centre of rooms. There are books in boxes waiting to be stacked in the bursting shelves. Evidently they will wait a long time. There are paperbacks in stacks lining a stairway that leads inevitably to more books. 'Ah, The Complete History of Scotland in twenty-seven volumes, just what I need.' The proprietor has an untamed grey beard and a bookish look. It is as if he has become part of this parallel world, staid and learned and yet somehow, perpetually on the verge of total disorder. You will never find what you're looking for here, but you're sure to find something good." - Tim McGrenere, Christine Oreskovich and Kyle Shaw, The Slicker Guide to Halifax, (1995), pp.21-22. Reprinted without permission (in lieu of a lawsuit). I like the Dickensian, the Kafkaesque, the Pirenesian, the Joycean as much as the next person. Yes, I live in a Cornell Box and Yes, I am a member of the Juxtapositionist League of America. But taxonomy is fun too and so we like to classify and reclassify and make little signs. Unfortunately I do have the 'gift of acquisition' and thus the piles of extras tend to obscure the organization, especially for the cursory customers, such as our Slicker persona above. Not dark, maybe dusty but not musty. And people do regularly find what they are looking for or the shop would be gone by now : serendipity won't pay the bills. Schooner Books, in Halifax (5378 Inglis Street, ph. 902-423- 8419), is to be blamed for my career choice. That shop, run by the most excellent and personable team of John Townsend and Mary Lee MacDonald, gave me an invaluable apprenticeship. I was actually *allowed* to work there (despite my untidy tendencies) part-time and full-time for 7 years. I say "allowed", because this was my hobby, my main earthly delight. How could it be that I was actually being paid to be among books, wonderful books, buyable books all day. Wow!!! I began my own shop in June of 1987. (The date is not hard one for me to remember as my son was born that same very busy week). The business opened rather recklessly with only 200 or so books arranged on the middle-level shelves of a 16 foot high room, in downtown Halifax. Decent books but not very many of them and that was my worry. But God in His providence arranged that our previous location (on Granville Street) would be one of those abhorred-by-nature book-vacuums and thus it is that we have a stock aplenty. On the personnel side, Troy Forbes, Ferne Welsman, Sydney Hansen and myself are the current staff. Karen Currie, Amelia Chester, Mark Hamilton, Peter Bustin, Mona MacLean, Brett Mennier, Mary Jo Anderson, Sydney Hansen, Roger Marsters, Alexander Monker, Tony Janik, Steve Laugher, Jane Mothersell, Christopher Snook, Jane Sodero, Bill Roberts, David Brooks, Susan Bustin, Kelly Smith, Ginny Coyne, Blaine DesPres, Greg Denton, Rick Armstrong, Frances Willick, Scott Bracey, Erin Johnston, Phil Laugher, Stan d'Entremont, and my mum and son have all done sterling service here. John W. Doull, Bookseller, has, in its 25th year, moved to its own digs in Dartmouth: 122 Main Street (also known as the No.7 highway), just past the first set of lights on Gordon and just before Long & McQuade Music. We are on bus routes 10, 54, 66, and 72. For our Halifax customers the No.10 is on a direct route from Barrington Street, as well as Dalhousie and Saint Mary's [Bus stop: "Main Street after Gordon Avenue"]. There are bus stops directly in front of the new shop's location. On the 10 and 54 routes, the stop is three stops past Mic Mac Mall. Our hours of operation are 10:00-6:00, Monday-Saturday. Our phone number is (902) 429-1652.